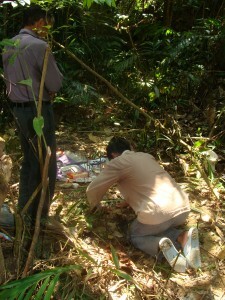 Mr. Du and Mr. Bay perform a Buddhist burial ceremony at Jerry’s and Al’s crash site to placate their wandering souls. The Vietnamese revere their elders and remain devoted to them after death. This is especially true in the rural areas of the Central Highlands, where traditions often remain intact, as do superstitions. Although a variety of circumstances prompted Mr. Du, a former Viet Cong leader, to help us locate Jerry’s and Al’s crash site, deep within the Que Son Mountains, I believe that culture was partially responsible, too. Mr. Du was eager—after four decades–to perform a proper Buddhist burial ceremony with me nearby, as a family member–presumably to put Jerry’s wandering soul to rest. The concept of a wandering soul is very significant in the Vietnamese culture, and may account for the reason that MIA remains often are returned by local and/or government officials. I mention this point with the hope that the Vietnamese government, who may have knowledge of remains—possibly warehoused all these years—will understand that a proper burial is part of our culture, too. Working unilaterally, the Vietnamese government has the power to return our MIA remains to their families, along with any documents that will help families bury a husband, father, brother or son with dignity. In our culture, doing the right thing is like “saving face” in the Asian culture, and I believe it’s now time for the Vietnamese to send our wandering souls home to their families – that’s doing the right thing. The belief behind the wandering soul is that the dead must be buried in their homeland, or their soul will wander aimlessly in pain and suffering. My conversations with several Vietnamese have led me to believe that wandering souls also bring a village bad luck. In fact, during the war, our Marines and soldiers broadcasted wailing sounds to the enemy over loudspeakers at night. I suspect it was very unsettling to the NVA and Viet Cong. I think Mr. Du felt that a Buddhist ceremony would finally give our guys a proper burial, since neither of us knew if remains would eventually be found. Through an interpreter, Mr. Du told me that Vietnam was Jerry’s second home, because he had been there a long time. I understood but told him that we wanted to bring Jerry’s and Al’s remains home so that we could honor them on special occasions, much like the Vietnamese do for their family members. I think he understood. 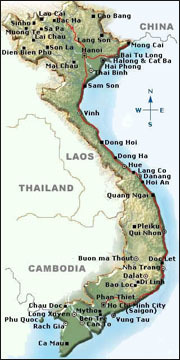 This entry was posted on Tuesday, February 15th, 2011 at 3:59 pm	and is filed under MIA Recoveries in Vietnam, Vietnam Crash Site. You can follow any responses to this entry through the RSS 2.0 feed. You can leave a response, or trackback from your own site.